I’ve come to a big realization lately. My thinking that our little man would arrive early was primarily driven out of fear. I wanted him to arrive early because the sooner he is earth side, the sooner he is in my arms and the sooner everything is safe. This fear derived from years of failing to conceive, followed by a successful IVF conception which resulted in an ectopic pregnancy loss. Every time we thought we were almost there, it was taken away from us. Call it PTSD. Call it crazy. Call it whatever you want. The point is: the past few years have been emotionally traumatic. In the infertility and pregnancy loss community, we support each other, but we also are too familiar with each other’s stories of grief and despair. It continues to fuel our own insecurities. I keep thinking back to a woman I met through a friend a year ago whose son was stillborn. She was due to be induced, but was sent home due to the labour and delivery unit being full. When she returned 48 hours later, their son had passed on. As I made my way through the 3rd trimester, this story sat in the back of my mind. I convinced myself that my son HAD to arrive before 40 weeks. There was NO WAY he was coming late. There was NO WAY I would face what this other woman did. In all honesty, I do believe that he will arrive safely. I can’t predict how or when – especially since I’ve turned my intuition down to protect myself during this pregnancy – but I know that he will be in my arms, crying, breathing, eating and being the little human being that we have created. I feel very fortunate to have many friends in the medical and holistic wellness communities that I can turn to for support. Even though the old wives tales aren’t helping me to bring on my labour, I have been reassured by many friends that it’s completely normal for a first time Mom to go overdue. Since I have zero medical reason for an early induction, our local hospital would not even consider it a possibility until 10 days past my due date. That being said, I know that induction labours can be lengthy, have increased pain and also increase the risk of requiring a c-section. One of my nursing friends highly recommended I wait as long as I can before agreeing to induction. Tomorrow afternoon, I have an OB appointment. I’ll be 41 weeks. I keep hoping my son will arrive naturally before this weekend, but I know tomorrow is an opportunity to discuss my options with my doctor. I guarantee he will do another membrane sweep and hopefully that does the trick. My acupuncturist reminded me today that it’s ok to be happy. It’s ok to let go of the fears that have been deeply rooted in me due to past traumas and open myself up to joy and love as we bring our son into this world. Sometimes when you’ve spent so long being pulled down, you almost expect something to go wrong. It’s hard to let yourself experience true happiness. As I approach the birth of my son, I’m ready to accept it whichever way its meant to unfold. I will embrace it. I will own it. I will make it the best experience possible for my husband, my son and myself. Although there will always be fear during times of change, I will not let it steal my joy. We’ve come so far. We’ve worked so hard to get here. We deserve it. It’s our time and I’m ready. Symptom spotting is the biggest cycle of chaos you can fall into. Symptoms can change on a daily, even hourly basis. Don’t waste your days dwelling on every twitch, itch, and pain. Comparing your pregnancies is useless. It will do nothing but create anxiety. These are two separate pregnancies, two separate babies, two completely different experiences. Embrace this experience. Allow yourself to acknowledge the differences, but don’t let them overwhelm you. Recognize and release. The biggest battle a mother has to face during pregnancy after loss is fear. Get the biggest stick imaginable and beat that fear out of your mind, out of your house, out of your city, out of this universe! Understand that it will probably creep back in, but know that you have the power, the strength and the tools to tame the fear if it returns. I believe in a mother’s intuition. I believe in a woman’s intuition. You ultimately know your mind and body better than anyone else. If your gut tells you something is wrong, follow through with it. Make that doctor’s appointment. Go to the ER. Be an advocate for yourself and your baby. Even if you just need this one extra appointment to help fight back the fear, that’s ok. Loosing your previous pregnancy was traumatic. Sometimes just hearing that OB say, “everything is fine”, is enough to calm your nerves and bring back the hope. Be mindful that you only have a few “special treatment” passes to use. Ensure it’s intuition you are going on and not fear. During pregnancy, you need to focus on total mind-body health. Maintaining a healthy physical, mental and emotional state will help you face each day with a more positive outlook. Recognize what helps to bring you back to a place of calmness a midst the chaos of the unknown. Take the time you need to safely return to yourself. Don’t let everything pregnancy overwhelm you. Enjoy life’s simple pleasures. Whether that’s meditation, yoga, or a quick walk in the park, set aside some daily time to reconnect. Acknowledge all of the positives of this pregnancy. Set small milestones. Celebrate each time you reach one. Let your guard down and connect with your child. Place a hand over your belly and another over your heart. Take 3 deep breaths. Imagine sending love from your heart to your womb. Let your baby know how welcome, how wanted, how loved it already is. You are a mother. Your baby is on their way to you now. Proceeding with 2 – everything is on track! Why do I always let my fears encompass me? I just got off the call with my RE. He said our Day 6 embryos are grade 17. Even though they are graded above average by my clinic’s standards, they have slightly less potential due to their slower start. He said that even thought they don’t like to transfer 2 for women in my age range, they will agree to transfer 2 for me. He wanted to ensure that my husband and I understood the risks associated with a twin pregnancy. Yes, we understand. My mom is a twin. My sister and brother are twins. I never thought I would have ever wanted twins until everything we have been through over the past 3+ years. With my high ectopic risk, one pregnancy with either one or two babies could be enough for us – the end of our fertility treatments. If we have twins, we will definitely be satisfied. If we have one child, we may even be satisfied – at least for now. The discussion of IF we pursue treatment for another child would be one that we would have to think long and hard about. I’m crying as I re-read what I just wrote. I feel like we have such a chance to finally reach our goal of building our family, welcoming our children home. I’m excited, but I’m also scared. Thank you to everyone for your opinions yesterday. You helped to build my confidence to advocate for what we know – in our mind, body and spirit – is right for us. Our news about our FET officially being scheduled was exciting, but it also was frightening. Immediately after I hung up the phone, my mind started racing with the list of what I needed to do: book travel, tell employer, tell parents, line up MIL to watch fur-babies, ensure no conflicts in calendar, etc. The first step was booking travel. We found a reasonable deal on Expedia, but I just couldn’t shake the lingering and overwhelming anxiety of what is to come. Yoga, meditation, deep breathing, a hot shower, calm and soothing music – none of it was working to bring me back to my balanced and peaceful state. By this afternoon, my back/shoulders were sore (as anxiety gives me a “carrying the weight of the world” feeling) and I had a tension headache. This evening, I had a much needed reiki session with my Reiki Master. We talked lots about the journey behind and before me. Before me… that’s where the fear comes in. 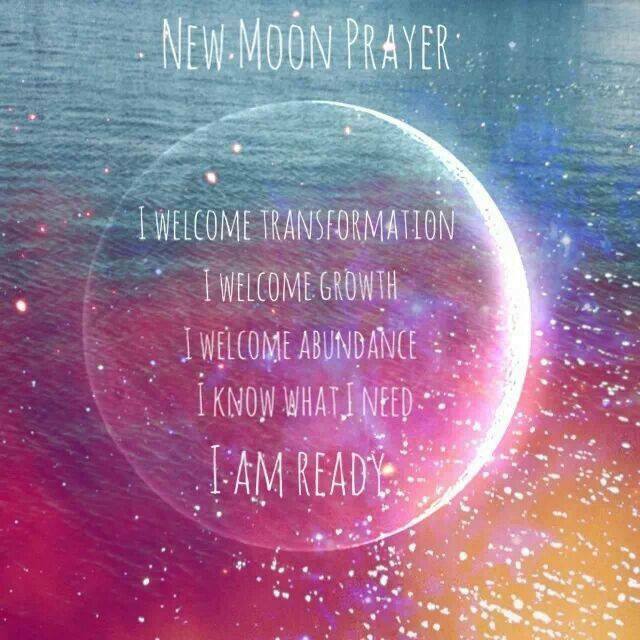 Tonight is the first New Moon of 2015 – a perfect night for self care. I had a warm bath, then got out my new moon journal to record my desires and wishes – what EXACTLY it is I want to manifest into my life. I also made a list of the feelings I want to have during my FET and the 2 week wait. That is the power of the New Moon: you regroup and reconnect with self to regain your focus. 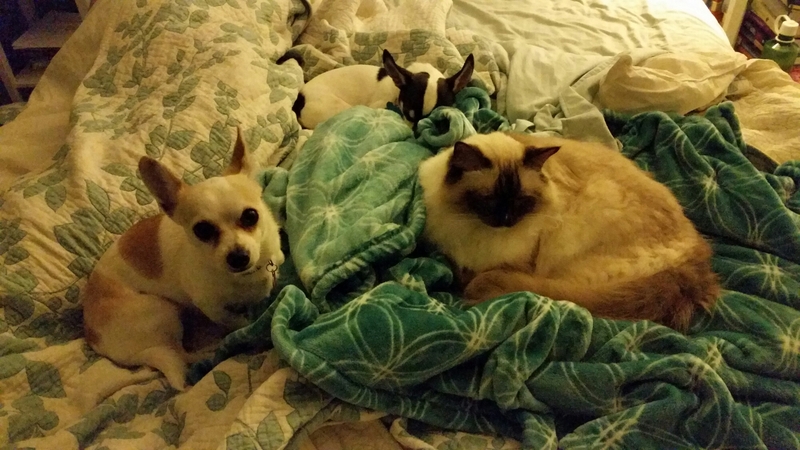 Worrying creates tension which is a hostile environment for my babies. I can’t control the outcome of this cycle, but I can recognize when I’m becoming imbalanced. I can control my mind’s focus. Simply put, it’s mind over matter. I can do this. I’m ready to do this. We are sitting in the Victoria International Airport. 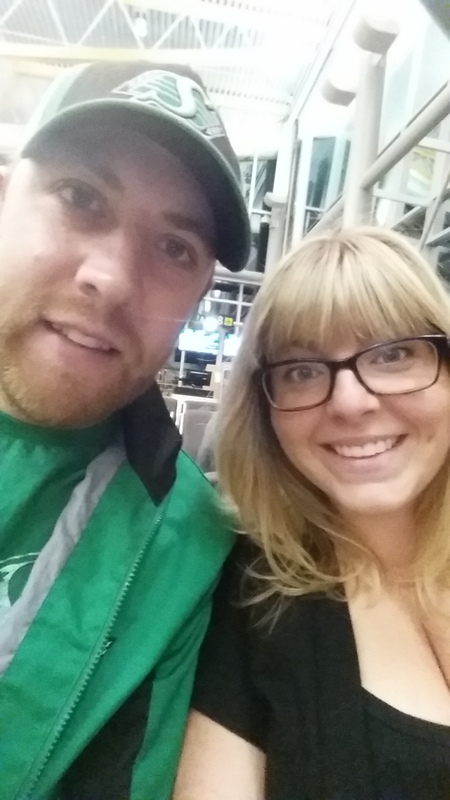 I agreed to fly out early to please my husband even though we could have left last night and gotten home at 1am. Instead we woke up at 4 am and will be getting home at 1:30pm (yes, our second flight is already delayed). I slept like crap last night which seems to be a pattern over this past week. There’s so much going on. The lab called yesterday to let us know we have 2 embryos frozen. I’m a bit surprised at how low this number is since they pulled out 27 and initially fertilized 13. No matter what, we still get another chance (for baby #2). I’ve been watching Mad Men on Netflix lately. In one episode, the main character Don Draper says something about how fear lies in anticipation. The whole IVF process is a series of steps. As we approach each milestone, we fear the what ifs as we anticipate moving forward towards our goal of baby. It’s 10 days til my Beta. I keep placing my hand on my belly. I keep talking to my baby as if she is in there getting comfortable for her 9 month stay. I can’t guarantee that this will be the outcome, but I’d rather live in love than fear. I’ve been meditating and journalling this weekend to uncover some of my fear around our upcoming IVF cycle. The main thing I’m afraid of is failing, again. 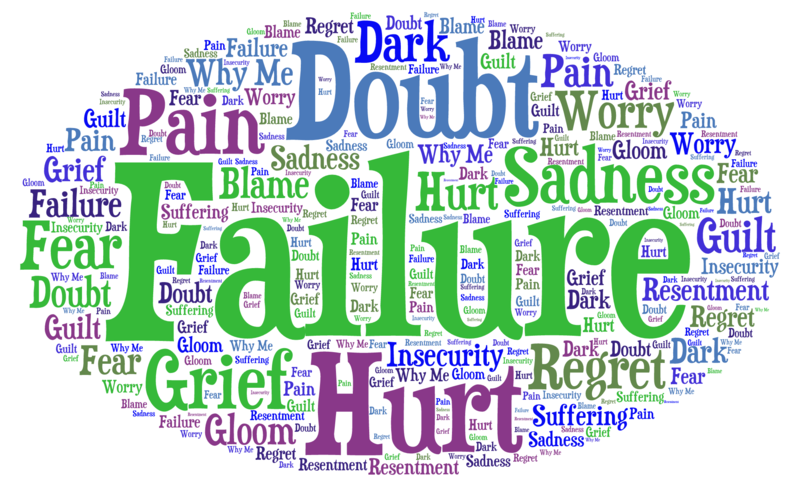 The feelings that are associated with failure are heavy, dark and painful. The feelings associated with success are light, airy and joyful. This evening, I listened to a meditation by Yoga Goddess founder Zahra Haji. In this meditation, Zahra has you visualize the feelings within your heart and then release them to Mother Earth. Zahra explains that releasing feelings that no longer serve your good fertilizes the soil of your body and soul. Your tears are needed to cultivate and replenish the soil. This image resonates strongly with me. No matter what journey you are on, each aspect of life follows a cycle of birth, death and rebirth. To replenish yourself, you need to release the pain and be reborn as a stronger person. Each fertility challenge is a lesson. Ultimately, you can’t move forward without facing the fear, the pain and the grief. Feel it, make space for it, and allow it to let go. Then, give your heart (and yourself) comfort and love. Through my word cloud exercise I realized that to be successful, I need to move forward NO MATTER WHAT THE OUTCOME. Wow. That concept is huge. I’m not planning for failure. I’m going into my IVF with an open heart and mind. No matter what happens, I will pick myself up and step forward. 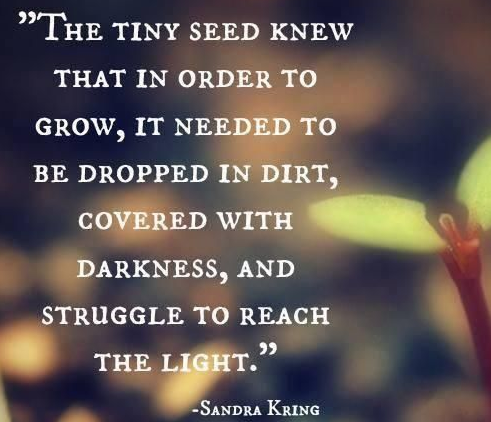 Personal growth is too fascinating to stay in the shadows of despair.